Inventory We are a resale marketplace, not a box office or venue. Ticket prices may exceed face value. This site is not owned by CIBC Theater . The CIBC Theatre opened in 1906 originally as the Majestic Theatre in downtown Chicago and was recently known as the Bank of America Theater then spent a few years as PrivateBank Theater. The theater has gone through a couple of different name changes including recently the LaSalle Bank Theatre, and the Sam Shubert Theatre before that. The CIBC Theatre has gone through a couple different restorations. The most recent took place in May 2006. 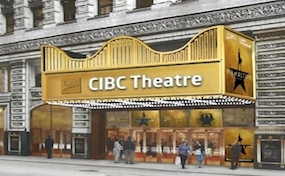 The CIBC Theatre box office has been host to many traveling Broadway shows and events since. The most popular show to have multiple extended stays at the CIBC Theater has been the Book of Mormon, and Hamilton. CIBC.Theater-Chicago.com is not affiliated with any primary box office or supplier. We are a privately owned and operated business specializing in sales in the secondary market. To buy tickets for any CIBC Theatre events in Chicago simply click on the event of interest or call our operators at anytime.